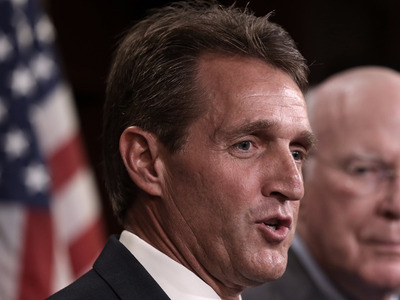 Arizona Sen. Jeff Flake said Wednesday it’s “quite possible” Donald Trump will lose his state after a series of polls showed the race between the presumptive GOP nominee and Hillary Clinton as either extremely close or in the former secretary of state’s favour. But Flake, in an interview with Business Insider, said it won’t impact fellow Arizona Sen. John McCain’s efforts at reelection in the traditionally deep-red state. Clinton is leading Trump by half of a percentage point in Arizona, according to the RealClearPolitics average of several polls. The presumptive Democratic nominee was given a 53.9% chance to win the state in FiveThirtyEight’s election forecast, which was released Wednesday. The projection gave Trump a 45.7% chance of winning in November. McCain has a 5.5% lead over his Democratic challenger, House Rep. Ann Kirkpatrick, according to the RealClearPolitics polling average. However, a recent poll from Public Policy Polling showed that McCain’s lead over Kirkpatrick had dwindled to just 2 points.